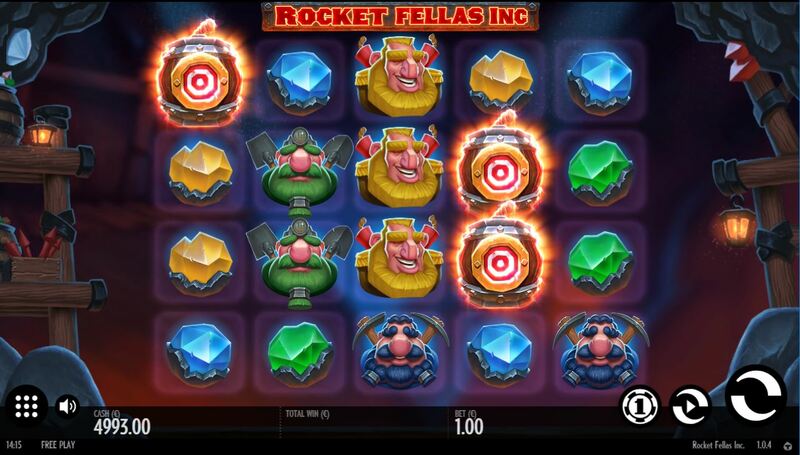 Rocket Fellas Inc slot is strangely neither about spaceships nor fireworks, so don't expect fizzes and bangs as you would from Netent's Wild Rockets or IGT's anything but Fantastic Fireworks game. Thunderkick have given us instead some zany entrance to a mine as the background, a soundtrack of funky 1970's style music and some odd looking cartoon miners with facial hair issues. Yep! - I said it was weird and one can only imagine that the designer had put the wrong kind of mushrooms in his Risotto. Anyway, will these rockets send our bankroll sky-high or will it disappear like a damp squib? 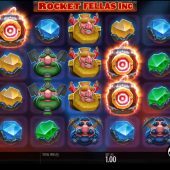 We get a grid of 5 reels, 4 rows and 30 paying lines here on Rocket Fellas Inc with stacked icons and an interesting Wild feature. You can play for as little as 10 coins and the best 5-of-a-kind is Wilds or Targets at 30x, Red Miner 15x, Yellow 12.5x, Green at 8x and Blue at 7x with 4 different coloured crystals paying from 3.5 down to 2.5x respectively. The bonus scatter is on all reels and is a Metal Fist, but before we see the feature there are the Wilds to discuss! You don't get Wilds initially on any reel but the first and these are the Rockets which can appear on 1 up to all 4 rows. When they do, they zoom across the row they land on and any Targets on that row will turn into Wilds and if the Target is stacked the whole stack goes Wild. The Targets pay the same as Wilds so any combination of them on a paying line will award the win. If you see 3 or more Fist scatters in view you will get 10, 15 or 20 free games for 3, 4 or 5 respectively. These can retrigger and you will also earn 3 extra spins for 2 in view. Predictably, the Wilds act more favourably here which means that any Target turned Wild on the same row by a Rocket will become a sticky Wild. Yes, as in the base game all Targets on the reel will turn Wild for that spin if a Rocket hits just one of the, but only the one on the same row can become a sticky Wild afterwards. This sticky Wild is good to have as in subsequent spins any Targets landing on that column or reel will turn Wild for that spin regardless of if a Rocket activates them or not. This bonus is quite novel and fun to watch - you may indeed see some big win fireworks!